When you think of chicken with broccoli on the side, your mind might automatically remember a long-ago meal of dried-out chicken breasts with soggy stems of broccoli. We’ve all had that one dish that didn’t turn out quite right, yet we ate it anyway – to please the chef, to not waste food. Tonight, however, you are in for one tasty plateful of spicy-herb-glazed chicken with perfectly cooked broccoli, just follow the directions and all will be right with your meal. As always, start with the highest quality ingredients you can find. Pastured, or free-range, poultry is the best, and if you can find it locally, then that is wonderful news! If it must come from farther, you can order it online. The bottom line? Don’t stress too much about where your meat comes from. Do the best you can with what you have, use vegetables that are in season and choose organic whenever possible. Drink plenty of water, get enough sleep, you know the drill. For us, to keep Paleo food exciting and entertaining, we like to use plenty of spices. And having abundant spices in the kitchen will help to nourish your sophisticated herbal palate. Dried onion and red pepper flakes, crushed coriander – toss it all in! 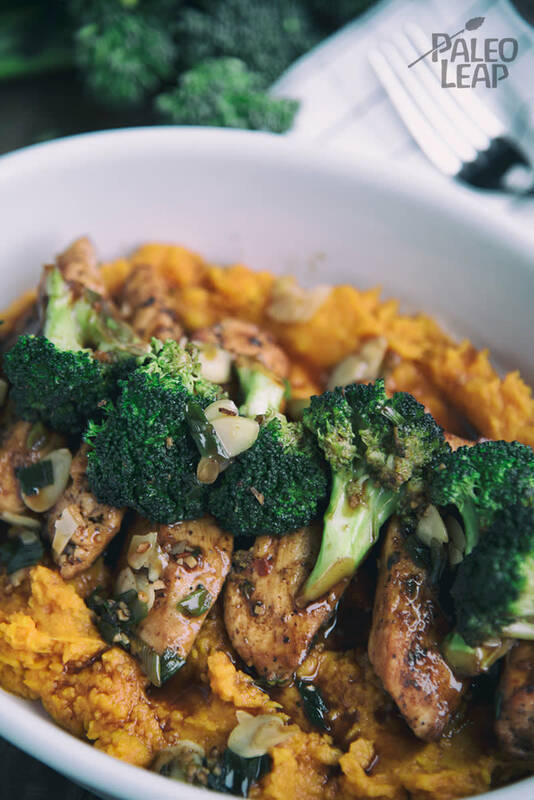 You’ll love the mashed sweet potatoes under the broccoli and chicken, it is the essence that holds the dish together. If you are searching for a lower-carb option, why not try some cauliflower rice instead? Place the diced sweet potatoes in pot of boiling water and boil until soft, about 20 minutes. Drain sweet potatoes and place in a large bowl; add the ghee, season to taste and mash until smooth. In a bowl combine the paprika, dried garlic, dried onion, coriander and red pepper flakes, then season to taste. Season the chicken pieces with the spice mixture. Melt cooking fat in a skillet over medium heat, cook the chicken on both sides until cooked through, about 8 to 10 minutes. Set the chicken aside on a plate and add some more cooking fat to the skillet. Add the broccoli, pour in the chicken stock and cook until the broccoli is soft, 4 to 5 minutes. Bring the chicken back to the skillet, sprinkle with green onions and cook until warm, about 2 to 3 minutes. Serve the chicken and broccoli on top of the mashed sweet potatoes.